The aim to counter speculation is valuable, but money creation by banks has not been the root cause of the financial crisis. The “sovereign money” initiative on which the Swiss will vote on June 10 errs by thinking that it found a magic wand by requiring that retail deposits in banks be fully backed by reserves held by banks at the central bank. A well targeted regulation of banks remains the best option, even though it is a challenging task. It is important to keep in mind that the regulatory institutions in Switzerland and abroad have not remained passive since 2007, far from it. A broad range of prudential rules have been put in place and strengthened. One only has to read the vocal criticism of these rules coming from the financial sector to understand that they are not mere cosmetic changes. Far from lagging behind Switzerland has been one of the stricter countries, simply because our small size implies that we cannot take the risk of simply waiting for the next crisis. Financial regulation is a tough job, and one that is never fully completed. Regulators have to constantly track the changes in the environment and adapt to them. We can never be 100 % sure that all problems have been handled. But the view that all it takes to solve the issue once and for all is a move to a sovereign money system is an illusion. It is fully understandable that people are surprised to learn that coins and banknotes only make a small part of the means of payment, with the bulk consisting of deposits in banks. But this is nothing new and a set of rules have long been in place to stabilize money creation (for instance banks have to put a share of deposits in liquid assets). The 2007-2008 crisis in the United States did not originate in deposit-taking banks. We can split financial intermediaries in two groups. Deposit banks where households hold accounts are the first one (including for instance Citogroup or Bank of America). The second group consists of other intermediaries, including investment banks which do not rely on deposits to fund their activities (for instance Bear Stearns or Lehman Brothers), as well as a range of unregulated intermediaries which make the shadow banking sector. The monetary creation on which the initiative focuses takes place only in deposit banks. When my bank grants me a loan, it immediately puts the money on my checking account. I become both its debtor (via my loan) and its creditor (via my account). By contrast no such operation takes place in the second group. 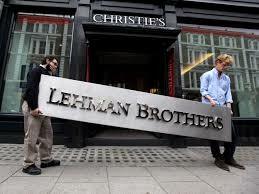 When Lehman Brothers bought a security it did not create new credit but instead bought assets that already existed. The funding came from short-term borrowing from other investors. Therefore the debtors and creditors were different entities. But it is precisely in investment banks that the crisis originated. This explains why neither Bear Stearns nor Lehman Brothers are still around. Of course the crisis set shock waves that impacted deposit banks, but the heart of the problem was not money creation by these banks (more details are given at the end of this post). The initiative would make deposit banks perfectly safe as they would be restricted to only hold claims on the central banks. This safety is however very misleading because the financial system overall would not be strengthened, to the contrary. Risky lending to firms would migrate towards other financial intermediaries. This amount to pushing the risk onto a segment of financial markets that is much less transparent, and the problem is that the risk we do not see always ends up making more damage that the risk we can track. As pointed above intermediaries that are less regulated than banks can create a major crisis. Ironically, the initiative would re-create Lehman Brothers. 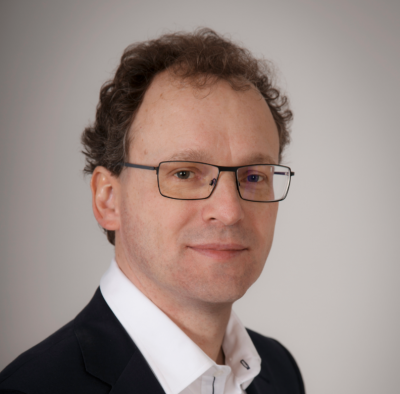 The initiative puts the Swiss National Bank center stage by assigning it the additional task of setting the volume and composition of credit, and to be a funding source for all kinds of investments. This is a bad idea for two reasons. While the SNB does a good job, evaluating and granting credit to firms is not its expertise. It is hard to see how it would do a better job at this than banks currently do. In addition the independence that is necessary for the SNB is granted to it precisely because its mandate is well targeted. Giving it additional tasks would weaken this independence. We can easily imagine the parade of lobbyists pleading how special and vital their clients are. The proposal requires that credit be set by a « committee made of representatives from all stakeholders in the economy » [my translation], whose task would be to « offer banks the opportunity to make additional loans along economic, social and environmental targets of the government, validated by the committee» [my translation]. Why reinvent what already exists? The Swiss Condédération and Cantons are free to financially support some sectors and activities, such as the production of green energy. There already are committees representing stakeholders: the Federal and Cantonal Parliaments. Of course the cost of any subsidy is then explicit, and its supporters must motivate why the support is necessary. But in a democracy, this is how it should be done. The 2007-2008 crisis saw an abrupt credit crunch, but with no relation with bank deposits. The problem instead was with short term lending between various financial intermediaries. 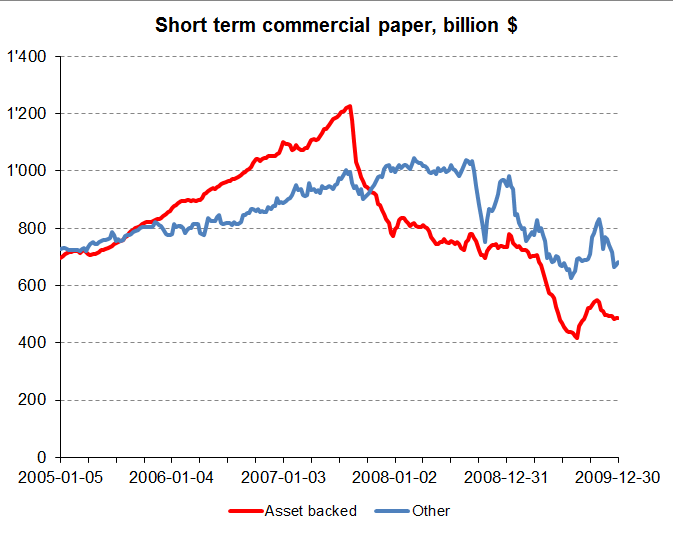 This is clearly illustrated by the short term « commercial paper » lending market. The figure below shows the weekly value of outstanding loans between early 2005 and late 2009. 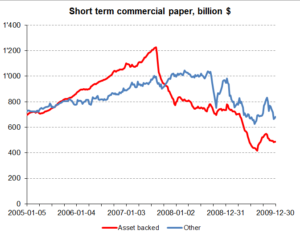 The red line shows the loans to intermediaries investing in securities backed by assets, primarily mortgages. The blue line shows the amounts lent to other firms (financial and non-financial firms). The figure shows very clearly the collapse of asset-backed lending in the summer 2007 when the market lost its illusions on the health of the housing market. Lending to other firms also decreased, but in a less abrupt way, and that decrease was primarily a consequence of the sharp recession, instead of the spark that ignited the crisis. What about deposits in banks? The second figure shows the weekly values of demand deposits and savings deposits. 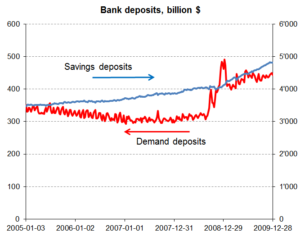 The picture is again crystal clear: far from collapsing deposits instead increase. The reason is simple: at a time when all investments looked risky, households preferred to put their money in the safety of bank deposits. The credit crunch of 2007-2008 is clearly unrelated to bank deposits, and thus to the money creation by banks that the initiative views as the source of all financial crises.